You All Know That, This Software Is Come With A Trial Period. So It Only Work For 14 Days And Than You Can Not Use It Anyway Except Pay For It. But I Have A Trick To Use It Lifetime Without Any Efforts. So Follow The Tutorial And Enjoy! First Of All Download The File Below And Extract It. Now There Are Software Called Hide My IP In Download Package. Install It To Your Computer. Now You Can See That When You Started The Software It Says Like 14 Days Left Or anything Else. Now We Need To Remove This Time Limit. Open Run And Type Regedit And Press Enter. It Will Open Registry Editor. And There You Can See A Value Named KEY Delete it. See The Screenshot Below ! 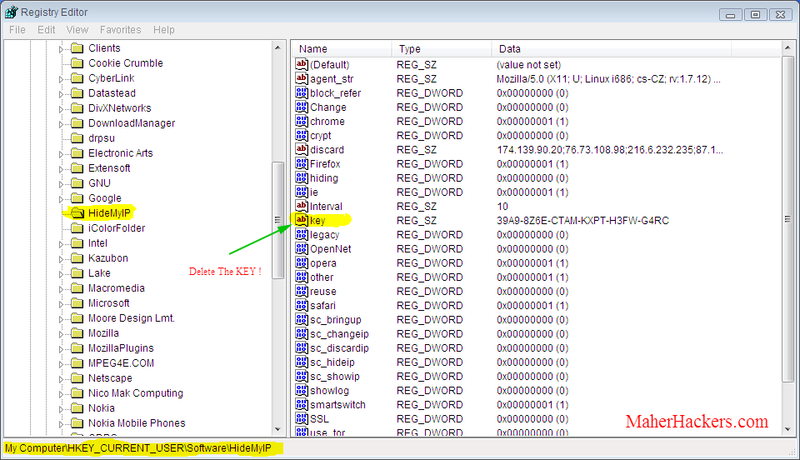 Now Open Hide my IP Reset Time x32.exe OR Hide my IP Reset Time x64.exe as Depend On Your System. Now The Window Will Popup. You Can Click On Readme!! From The Popup To Read Instructions. Now Click On Install Date.Then Start And Then Close.